To many observers, Castle Rock may appear just as the lump of ground that the castle or its successors stand on. But the rock itself is a major geological landmark in the city, with its bare sandstone cliff rising 38 m to the castle terrace. Nottingham owes its location to its geology, where the topographically resistant Triassic sandstone has survived as a bluff of high and dry ground that overlooks a shallow crossing point of the River Trent, which was itself a key transport corridor. The original Saxon settlement was on the more accommodating plateau now occupied by the Lace Market, while Castle Rock was first utilised very soon after 1066 when the Normans installed their military stronghold on its crest. Only the details have changed since. Figure 1 . Castle Rock seen from the southwest, with vertical joints defining the serried buttresses of the sandstone cliff. Not surprisingly, Castle Rock is formed of the Nottingham Castle Sandstone, a formation of pale brownish sandstone that is about 65 m thick in the Nottingham area. Formerly known as the Bunter Pebble Beds, this is now regarded as a sub-division of the Lower Triassic Sherwood Sandstone Group, dated at about 250 million years old. It overlies the deep red Permian Lenton Sandstone, and in turn is overlain by the red-brown mudstones and sandstones of the Triassic Sneinton Formation (previously known as the Waterstones), part of the Mercia Mudstone Group. The sandstone is a splendid example of a continental sedimentary rock with clear fluvial origins. It is mostly medium- to coarse-grained with particles dominantly of quartz up to about 1 mm across, but there are many horizons rich in well-rounded pebbles of quartzite or vein quartz. Sediment was derived from erosion of contemporary Triassic uplands, notably the Variscan mountains that lay to the south of what is now Britain. Deposition took place in a huge braided river system that spread across the semi-arid inland basins occupying much of southern, north -western and north -eastern England. The rivers flowed only periodically, in response to seasonal rainfall on the Variscan mountains. Each flood season brought new sediment, and the replenished rivers shifted their channels, leaving banks of sand and spreads of pebbles across the floodplain. Much of the deposition was in sand bars between channels, and in point bars inside meanders, where horizons rich in pebbles and mud-flakes preserve the onset of each flood event. When the sand bars were finally buried by further sedimentation, their complex internal structure of inclined lamination, or foresets, was beautifully preserved within cross-bedded units typically a metre or so thick. Figure 2 . 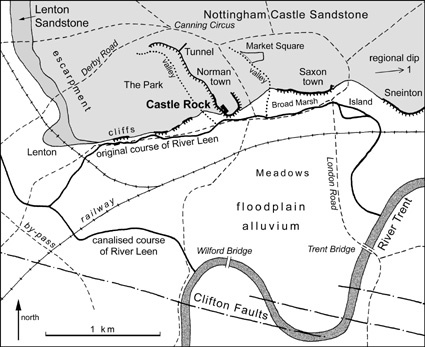 The geology and surrounds of Castle Rock, showing the River Leen in its original course along the foot of the river-cut cliffs that fringe the Trent floodplain where it breaches the sandstone escarpment. Most of the main cliff faces around Castle Rock expose rather unexciting and homogeneous sandstone, and are anyway rather inaccessible for casual study. But there are two splendid exposures of note. Lenton Road lies in a deep cutting round the north of the castle walls, beyond the gate, and its southern face exposes cross-bedded pebbly sandstone in units about a metre thick, with foreset beds dipping into the cutting face. 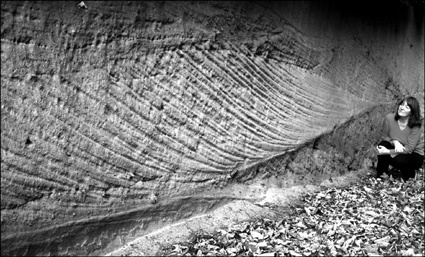 A rounded embayment exposes what appears to be a channel structure with convergent dips, but these are merely apparent dips in uniformly inclined foresets, viewed in rock faces at different orientations. The most splendid example of cross-bedding within a single sand bar is exposed farther north in the clean vertical wall on the north side of the lower exit of the Park Tunnel (Fig. 3), and there is a wealth of other sedimentary structures exposed in and around the tunnel. Figure 3 . Current bedded sandstone exposed by the entrance to the Park Tunnel. The Nottingham Castle Sandstone inherited its gently dipping tectonic structure from its position on the eastern limb of the Pennine Anticline, which was uplifted by tectonic movements on the periphery of the Alpine orogenic belt. It now dips eastwards at about one degree, but otherwise exhibits remarkably little deformation. The sandstone is a weak rock; it has a sparse cement of clay particles that bridge between the quartz grains (Fig. 4), and the many open pores were formerly occupied by a primary calcite cement that was dissolved away by circulating groundwaters (the cement survives in the same sandstone formation at depths of hundreds of metres). The sandstone gains its mass strength from the scarcity of its fractures. Major bedding planes are widely spaced, and joints are mainly restricted to a single system aligned roughly NNW-SSE, and dipping steeply to the west; these have a mean spacing of about 15 m along the Lenton Road section. Joints in the same system are spaced more closely within a belt immediately west of the Castle, creating the unstable rock slabs on the southwestern side of Castle Rock (Fig. 1). Castle Rock stands at the southern end of the west-facing escarpment of the Triassic sandstone. This extends beneath the city centre, then northwards through Nottinghamshire, forming sandy hills with soils so poor for agriculture that they were left as the woodland growth that formed the core of Sherwood Forest. In Nottingham, the scarp face of this landform has been reduced by steady denudation to a gentle slope on the eastern side of the Leen Valley, while the short dip slope is rapidly lost beneath the Mercia Mudstone cover on the east side of the city. Castle Rock itself forms a ridge that merges into the dip slope around Canning Circus. On either side there are valleys. The valley to the west drains down through the Park Estate; the valley to the east drains down the dip and is where the original Nottingham market place was established, separating the Saxon and Norman towns on their respective hills (Fig. 2). Both are now small, dry valleys in the permeable sandstone, that may have supported considerable run-off during the last (late Devensian) glacial period when the ground was permanently frozen. It would be tempting to describe the Park face of the ridge either as a subsidiary escarpment created by a stronger band within the sandstone or as a minor fault scarp that breaks the dip slope, but neither structure has yet been recognised. The entire sandstone escarpment extends no farther south than Castle Rock, although the sandstone itself extends below the Trent valley alluvium as far as the Meadows, where it is terminated by the Clifton Faults. These pass almost east-west beneath West Bridgford, Wilford village and the Nottingham University campus, and throw the sandstone vertically down to the south, displacing its outcrop way to the west. The steepness of this southern edge of the sandstone upland, including the face of Castle Rock, is largely due to erosion by the River Trent and its precursors. Prior to the major Anglian glaciation, which ended about 450,000 years ago, drainage patterns in central England were radically different to those of the present day. At this time, the present course of the Trent between Nottingham and Newark, known as the Trent Trench, did not exist. Instead, drainage from the southern Pennines is believed to have flowed south-eastwards along a proto-Derwent tributary and joined a main proto-Bytham river north of Leicester, which flowed eastwards along the course of the present Wreake valley towards the Wash. During the Anglian glaciation, much of England and Wales was buried beneath a thick ice sheet that suppressed all pre-existing river drainage. On de-glaciation at the end of the Anglian period, new glacial deposits or areas of stagnant ice blocked the former Bytham river valley, and meltwaters were forced to find new channels. The Trent Trench was a new drainage course, cut across a former watershed by highly charged meltwaters as they found a new route to the Lincoln Gap. At the upstream end of the Trench, the meltwaters cut into the southern edge of the sandstone escarpment, along the line of the Clifton Faults. Although ice sheets associated with more recent glaciations have never reached the Nottingham area, at least two major episodes of periglacial conditions have led to further downcutting and widening of the Trent Trench to more than 2 km across. During these cold climatic periods, the Trent was highly charged with sediment and formed a complex, braided channel system with a gravelly floodplain. During warmer interglacial periods, including the last 10,000 years, the Trent has formed a single main channel meandering across its floodplain and depositing layers of silt and mud during floods. These slow but constantly shifting channel positions have eroded the valley sides back to a line of bluffs, with the highest and steepest section forming the southern tip of Castle Rock. By Saxon times the River Trent was established fairly well along its present course upstream of Trent Bridge, so that it had fallen back to just over a kilometre from the foot of Castle Rock. Fluvial undercutting of the Rock was still in progress by the River Leen, which flowed against the foot of the sandstone cliff until it was progressively more artificially controlled around the time the Beeston Canal and wharves were built in front of the Rock in 1793. Then in 1884, the river was finally diverted into the canal with an overflow into the Trent via the Tinker's Leen across the Meadows. Finally, works that were completed in 1973 diverted the Leen into the Trent upstream of Wilford Bridge. Figure 4 . 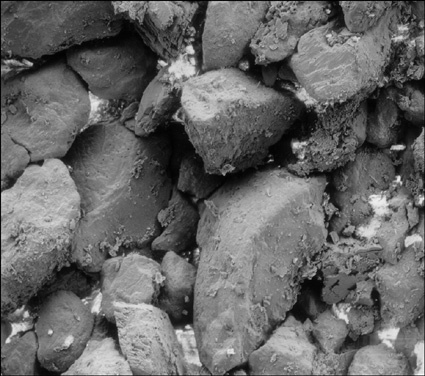 Nottingham Castle Sandstone, with quartz grains bonded by a minimal clay cement; an image from a scanning electron microscope; field of view is 4mm across. When nature ceased to undercut the Rock, man took over. The sandstone is almost the perfect medium for excavating cave houses, or cave rooms for any other purpose. Very few of Nottingham's hundreds of sandstone caves were actually dug out as dwellings, because a dank, dark room down a flight of steps from inside a house could be a very convenient storage cellar but made very unattractive living space. The main exceptions were along the Trent Valley cliffs where rock houses could be cut horizontally into the cliff face, with doors and windows to let in light. The first rock houses may have been cut into the foot of Castle Rock in Saxon times, but nothing survives that is recognisably from that era. Mortimer's Hole may date back to 1194 as a supply route from the civilian merchants in Brewhouse Yard to the garrison high above. The tannery cave, intersected by the Western Passages, is likely to be more than 600 years old, and was almost certainly not the first cave in the site. 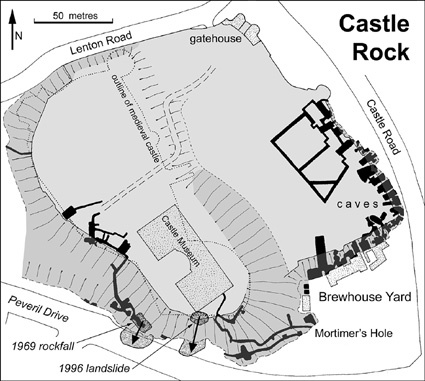 Most of the caves set into the eastern foot of the Rock are from later times, they include the beer cellars behind the two inns, and a series of rather featureless rooms that must have formed the back rooms of houses and workshops fronting on Castle Road (Mercian Geologist, 1992, v13, p5-36). Behind the northernmost of these, the linear caves forming a grid are among the youngest in Nottingham, having been excavated as air-raid shelters around 1939 (Fig. 5). Worthy of note is the Park Tunnel, cut through the ridge that extends behind Castle Rock. Excavated in the 1850s to allow access for horse-drawn coaches into the Park Estate, it was soon demoted to a footpath when new roads were built round the south of Castle Rock. But its geological benefit remains with the excellent exposures of sedimentary structures in the clean vertical faces cut in the sandstone (Fig. 2). Figure 5 . The caves and features of Castle Rock. With respect to Castle Rock's present appearance, the key question is how much the cliffs have been modified and undercut artificially in connection with the caves. A natural sandstone cliff normally degrades to little more than a "very steep slope" when an undercutting river takes a different course elsewhere. In Saxon times, erosion by the River Leen was probably maintaining a fresh face on the steep crag at the southern tip of Castle Rock. But the rest of the perimeter, including that facing the present site of Castle Road, was probably just a steep bank up which it was possible to scramble; comparisons with the western perimeter overlooking Peveril Drive, or with the slopes further north in the Park are appropriate. The toes of the sandstone ramparts were probably cut back in order to create a low vertical face so that a house could be built against it with cave rooms extending back into the rock - in the style of the Trip to Jerusalem Inn and the Brewhouse Yard Museum buildings. 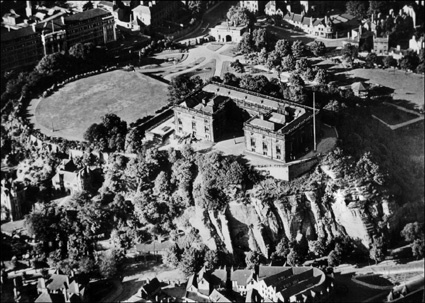 Furthermore, each successive generation of buildings was probably cut further back into the cliff to remove weaker weathered rock and also to remove any old caves that might be declining in stability; cut-off remnants of caves are clearly recognisable in some of Nottingham's other cliffs. The net effect of man's activities has been to make the sandstone cliffs steeper and more dramatic at the back of an excavated sandstone platform around the site perimeter. The castle atop the rock has evolved substantially from its Norman original, and the building now in place is a mansion dating from the 1670s and largely rebuilt in the 1870s. Its surrounding terrace is formed by earth behind a masonry perimeter wall. The "Christmas Day landslide" in 1996 occurred when water pressure from a burst pipe caused the retaining wall to fail. Castle Rock itself was unscathed by this event, when only the soil and wall collapsed over the stable sandstone (Mercian Geologist, 1997, v14, p53-57). Rockfalls in 1939 and 1969 did, however, incorporate the sandstone bedrock, when large joint-bounded slabs fell away from the cliffs on the south -western corner of the site. In the later event, an almost vertical rib of sandstone, about 8 m high and long but only a metre wide, collapsed over the entrance to the Western Passages (Fig. 6). Precautionary engineering works after the 1969 event left the concrete buttresses and plugged fissures that are still visible above Peveril Drive, along with concealed rock anchors that stabilise the rock within this zone of joints (Fig. 6). Figure 6 . The heavily jointed western face of Castle Rock, over the lower entrance to the Western Passages caves. 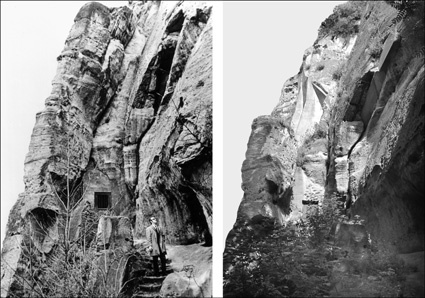 The photo on the left, probably taken in 1937, shows the intact outer buttress, before its demise in the 1969 rockfall. The photo on the right shows the massive concrete ribs installed after the rockfall to support the remaining rock. The main cause of instability now threatening Castle Rock is the growth of tree roots that reach down the sandstone fissures in their search for year-round water sustenance. The dominant weathering process on Castle Rock is the heaving out of joint blocks by expanding tree roots, while face retreat on the intact rock is extremely slow. 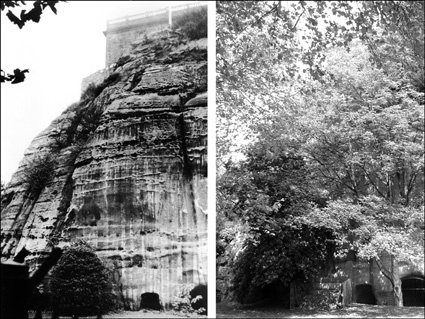 One sandstone buttress outside a cave beside Castle Road was destabilised by tree roots opening up a joint within it (Mercian Geologist, 1997, v14, p61); the trees were cut down, but the roots were left alive. Further remedial works were therefore needed and a steel frame was built inside the cave, so that the rock was anchored to it when coated with reinforced plastic that is almost undetectable because it has an outer surface embedded with sand grains. Figure 7 . The steep southwestern face of Castle Rock, devoid of trees in 1958, and almost lost to sight behind the greenery in 2004. Debate still continues between the environmentalists, who delight in a greening of the rock by natural tree growth, and the geologically minded, who prefer the boldness of bare rock. The low cliff above Castle Road has been deforested, but action was too late, and the rock rampart (below the castle walls and above the cave entrances) is still covered by unwelcome scrub undergrowth designed to hold a soil blanket on the less steep slopes. Meanwhile, newly planted trees and rampant ivy are steadily obscuring the fine rock exposure beside Lenton Road. Bare rock does survive on the high cliffs south of the castle, and successful remedial work on some parts has included a protective coating of glass-reinforced polyester that is almost invisible due to the sand incorporated in it. But these faces are steadily being lost behind trees that grow ever taller in front of them (Fig. 7). The future may be brighter, as growing tourist interest in the caves and Castle Rock is leading to wider appreciation of Nottingham’s geological heritage. Consequently, it is to be hoped that a new management plan of the Castle and its Rock, due to be completed by Nottingham City Council within the next 18 months, may lean towards the geological conservation aspects (a rebuild of the castle terrace, lost in 1996, is due within the same time frame). The city lost its castle landmark during the Civil War, and it would be a tragedy if the Castle Rock landmark was lost 400 years later behind a screen of trees.